Door panels are among the most abused Corvette interior parts. Obviously, they get the brunt of wear from being opened and closed – in the rain, snow, mud, and other elements. They also get marred by shoes and any large item you might try to wedge through your Corvette’s door opening. Then there are the armrests that are subject to dirt and oil on a daily basis. With some simple hand tools and an afternoon’s time, you can replace the door panels on your C3 Corvette with new panels. On our project Stingray, replacing the door panels with new panels from Zip Corvette is just one part of an interior update we are doing and will be sharing with you in upcoming articles. Our yellow project 1974 Stingray has an original tan/buckskin interior with deluxe door panels. With a goal of updating the look, we were inspired by the millennium Corvette that comes in yellow with red seats and carpets and black dash, console, and door panels. We also liked the clean look of the standard door panels as opposed to the deluxe panels with the chrome trim and carpet, feeling it would work better with the newer look we were trying to achieve. 01: Our original door panels were looking pretty rough, with covers over the arm rest to hide tears and stains. The carpet was also dirty and coming apart from the panel. 02: Carpet coming apart from the trim is a common problem with deluxe panels. 03: Start by removing the four screws from the panel, two at the top and two at the bottom. 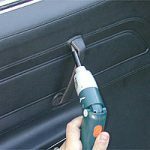 Then remove the door pull and the lock knob, which is held on by a clip on the back. Use a screwdriver to remove the clip and the knob comes right off. 04: Here is the lock knob and clip after removal. The plastic washer goes between the knob and the panel. 05: Once the hardware is removed, the panel can be removed by pulling the bottom away from the plastic grippers. Then lift the panel upwards off the top ledge. The plastic here is protection from moisture. If it’s lifting up, simply tape it back down. 06: This is the back of the original deluxe panel. If you are replacing a deluxe panel with a new deluxe panel, transfer the chrome trim and carpet to the new panel because Auto Accessories provides a standard panel to be made into a deluxe panel. This is a step we did not need to make since we are going to go with the standard panel for our millennium makeover. 07: You will need to cut holes into the panels for the door pulls. These need to be cut all the way through the panels. Here’s a tip: On the back of the panel where the holes come through, try to enlarge the hole, as this will make mounting the door pulls easier. 08: Here are our 65 & 69-77 Door Pulls, which come with new mounting screws. 9: We took this opportunity to clean up our door handles and lock knobs with fine steel wool. 10: Now the new door panels can be installed. Start by slipping the panel over the top lip of the door, then push down and inward, pressing the plastic grippers together to hold them in place. Then the four screws can be inserted to secure the panel to the door. 11: Here are our all new mounting screws. Each group of screws is sealed in a separate area for easy identification. 12: The door pulls can now be mounted. Use an awl to help align the holes by pushing it through the panel and into the screw hole, then wiggle the awl around until it is straight. 13: The hardware is the last to be installed. Secure the single screw for the door pull, then reinstall the clip on the back of the lock knob. Just push on the knob and the clip will slip into its groove on the shaft. 14: There you have it, brand new door panels that can really make your interior shine. We really dig the clean look of the standard panels and the black has more of a muscle-car appearance. Stay tuned and watch the development of our millennium makeover.